The best projects are those that can be accomplished quickly without compromising quality. Add on one that almost maintains itself and you’ve got a winner. CorsPro provides our clients this type of one-two punch when it comes to implementing SalesDoc Architect for automating the sales process and supporting our clients after implementation. We call these our Quick Start implementation process and the CorsPro Architect Manager Services (CAMs) program. 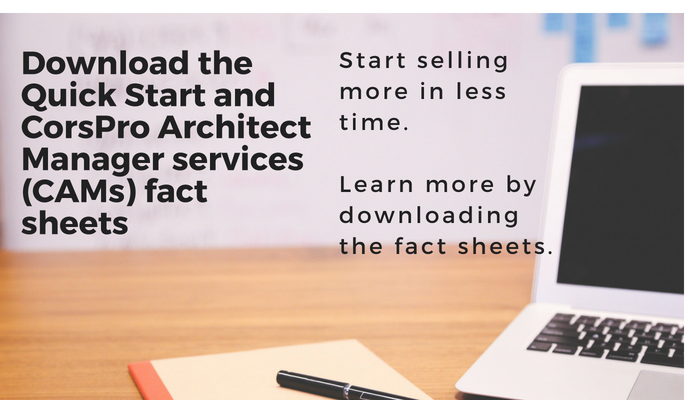 When we on-board a customer we employ our 4-stage Quick Start process to get customers up and running quickly in the first phase of implementing SalesDoc Architect. On average, customers spend one hour a week over the course of 6 weeks with the CorsPro Client Services team to get set up. Completion –Project is finalized and all tweaks from user testing have been completed. SDA is ready to be deployed to your users. Start selling more in less time. Customers are thrilled when they realize just how quickly – and painlessly – they can start maximizing the benefits of automating their sales process with SalesDoc Architect. Too many times customers will say they made excuses for not moving forward with implementing SalesDoc Architect sooner. They assumed that something like this would take forever to set up and deploy. If you’ve ever implemented a CRM or any back-office system you know how painful it can be. And it’s never done quickly – but SDA is different. We are able to move more quickly through the implementation process because our combined industry experience, best practices, and by leveraging the documentation and processes customers already have in place. In some cases, our clients lack the time to stay current with SDA maintenance and make the modifications to keep up with their rapidly changing industry. We created the CorsPro Architect Manager Service (CAMs) program to support these key administrative functions for you. With CorsPro’s one-two punch, you are sure to knock out your competition. The Quick Start process will have you up and running with a minimum of your time invested and on average within six weeks. After implementation, the CorsPro Architect Manager Services are available to help with post-implementation support and additional updates.